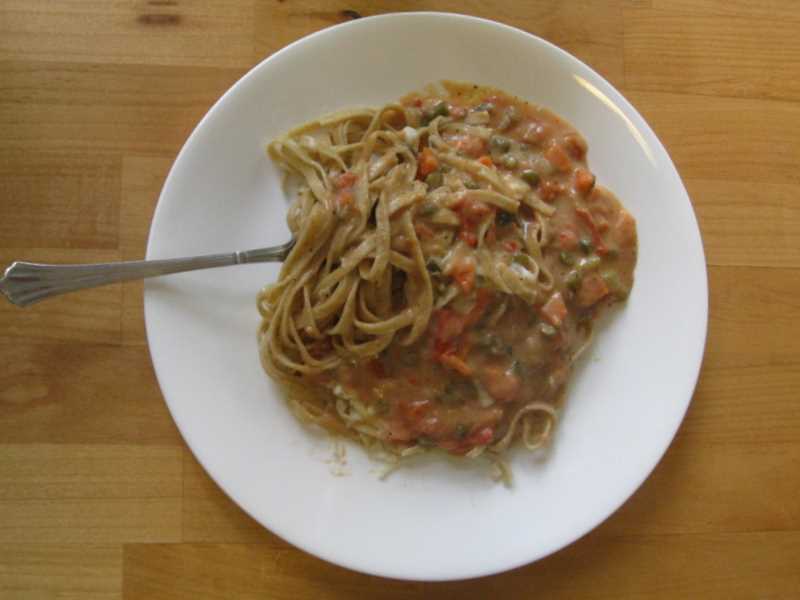 This week in our CSA, we received garlic scapes, tomatoes and Ohio City whole wheat linguini pasta. This sauce was created to utilize these ingredients as well as some other items on hand. I needed a sauce with some flavor since I was out of Parmigiano Reggiano cheese which I usually add to my Béchamel sauce. I served this sauce on top of my linguini with a sprinkle of mozzarella cheese. Summary: All ingredients are approximate as I don’t really measure much. Melt butter in a non-stick skillet. Incorporate flour a small amount at a time to make a paste. Add milk slowly and stir. Continue to stir frequently until thickened. In another pan, heat olive oil. Continue to cook until it looks like sauce, stirring occasionally. Once thickened, combine with Béchamel sauce. Serve over pasta with or without cheese. This sounds tasty and a nice alternative to tomato sauce. do you think using a couple minced garlic cloves instead of scapes would work? Hi Amy, any garlic would work for sure.